This page Supernatural is part of the mysticism series. The supernatural (Latin: super- "above" + nature) pertains to entities, forces or powers regarded as beyond nature, in that they cannot be explained from the laws of the natural world. Religious miracles are typical of such “supernatural” manifestations, as are spells and curses, divination, the notion that there is an afterlife for the dead, and innumerable others. 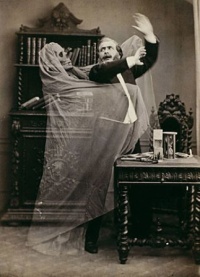 Supernatural themes are often associated with magical and occult ideas. One complicating factor is that there is no universal agreement about the definition of "natural" or the limits of naturalism. Concepts in the supernatural domain are closely related to concepts in religious spirituality and occultism or spiritualism. Additionally, by definition anything that exists naturally is not supernatural. For sometimes we use the word nature for that Author of nature whom the schoolmen, harshly enough, call natura naturans, as when it is said that nature hath made man partly corporeal and partly immaterial. Sometimes we mean by the nature of a thing the essence, or that which the schoolmen scruple not to call the quiddity of a thing, namely, the attribute or attributes on whose score it is what it is, whether the thing be corporeal or not, as when we attempt to define the nature of an angel, or of a triangle, or of a fluid body, as such. Sometimes we take nature for an internal principle of motion, as when we say that a stone let fall in the air is by nature carried towards the centre of the earth, and, on the contrary, that fire or flame does naturally move upwards toward heaven. Sometimes we understand by nature the established course of things, as when we say that nature makes the night succeed the day, nature hath made respiration necessary to the life of men. Sometimes we take nature for an aggregate of powers belonging to a body, especially a living one, as when physicians say that nature is strong or weak or spent, or that in such or such diseases nature left to herself will do the cure. Sometimes we take nature for the universe, or system of the corporeal works of God, as when it is said of a phoenix, or a chimera, that there is no such thing in nature, i.e. in the world. And sometimes too, and that most commonly, we would express by nature a semi-deity or other strange kind of being, such as this discourse examines the notion of. The term "supernatural" is often used interchangeably with paranormal or preternatural — the latter typically limited to an adjective for describing abilities which appear to exceed the bounds of possibility. Epistemologically, the relationship between the supernatural and the natural is indistinct in terms of natural phenomena that, ex hypothesi, violate the laws of nature, in so far as such laws are realistically accountable. Many supporters of supernatural explanations believe that past, present, and future complexities and mysteries of the universe cannot be explained solely by naturalistic means and argue that it is reasonable to assume that a non-natural entity or entities resolve the unexplained. Proponents of supernaturalism regard their belief system as more flexible, allowing more diversity in terms of intuition and epistemology. indistinct from nature. From this perspective, some events occur according to the laws of nature, and others occur according to a separate set of principles external to known nature. For example, in Scholasticism, it was believed that God was capable of performing any miracle so long as it didn't lead to a logical contradiction. As a pedagogical exercise, a physics university instructor might ask what the aftermath would be, as nature returns to normal, following a hypothetical miraculous intervention by God, similar to a modern thought experiment. 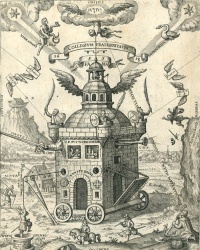 Some religions posit immanent deities, however, and do not have a tradition analogous to the supernatural; some believe that everything anyone experiences occurs by the will (occasionalism), in the mind (neoplatonism), or as a part (nondualism) of a more fundamental divine reality (platonism). incorrectly attributed to nature. Others believe that all events have natural and only natural causes. They believe that human beings ascribe supernatural attributes to purely natural events, such as lightning, rainbows, floods, and the origin of life. Unless indicated otherwise, the text in this article is either based on Wikipedia article "Supernatural" or another language Wikipedia page thereof used under the terms of the GNU Free Documentation License; or on original research by Jahsonic and friends. See Art and Popular Culture's copyright notice. This page was last modified 10:33, 4 January 2015.